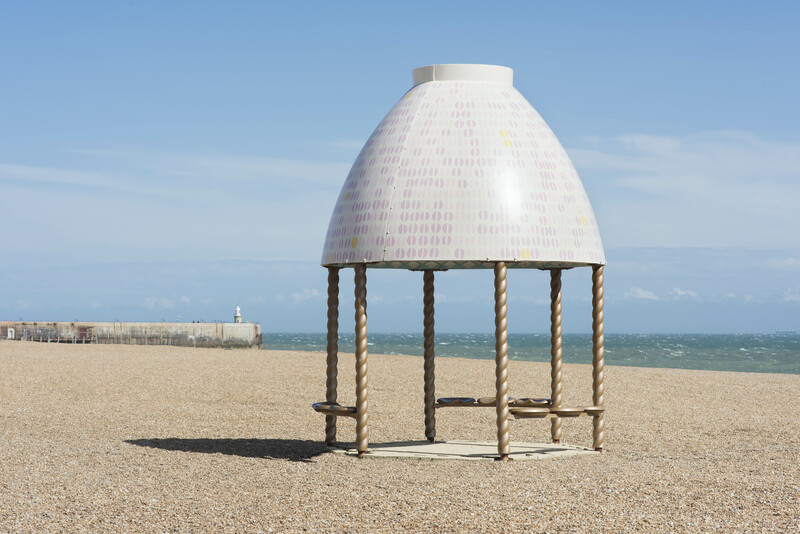 Philomena Epps reviews the 2017 Folkestone Triennial. 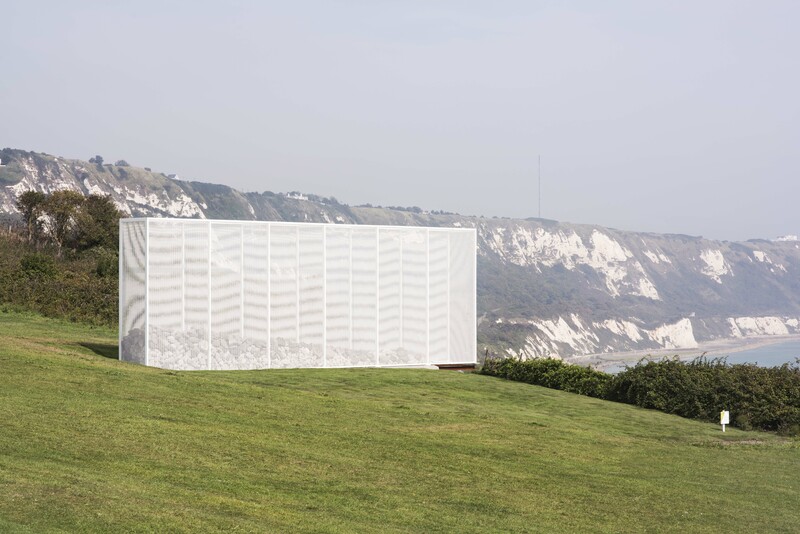 The fourth edition of the Folkestone Triennial (2 September – 5 November 2017), which featured nineteen new site-specific public artworks, was organised under the title ‘Double Edge’. The concept of ‘double edge’ refers to the two main axes around which Folkestone has developed: the seashore and the ancient Pent Stream (now underground). The participating artists were commissioned by Lewis Biggs, who previously curated the 2014 edition of the Triennial. The Triennial is organised by The Creative Foundation. In lieu of a publicly funded art space in the town, The Creative Foundation was established in 2002 as an independent visionary arts charity dedicated to enabling the regeneration of Folkestone through creative activity. The Triennial was set up in 2009 as one of one of their key projects. This notion of regeneration and public interaction is something that is centred in the discourse surrounding the Triennial. 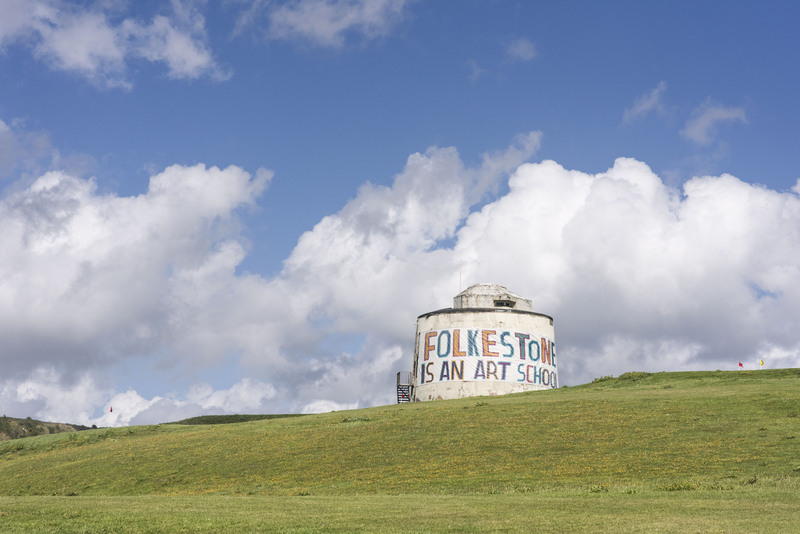 The desire to engage the public of Folkestone with the work is most apparent through the sheer volume of public programming – guided tours, walking tours, critics’ tours, symposiums, salons, field trips, study days, artist-led events, and student and school workshops. 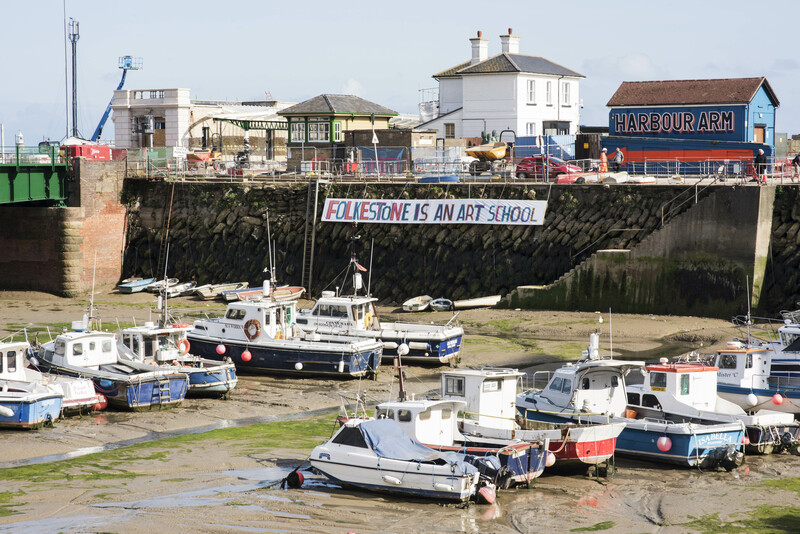 Bob and Roberta Smith’s (aka Patrick Brill) commission – FOLKESTONE IS AN ART SCHOOL – was significantly driven by these ideas of discussion and education. Although – unlike the nature of a public programme, which is likely to engage external resources – the project sought to reappraise all the skills and activities that already existed within the town. It was a neat, conceptual twist. Folkestone does not need an art school, because Folkestone already is an art school. ‘In creating this project I want to suggest that as human beings we are all students and all teachers and the world is in fact a big university… Folkestone has an incredible community of artists and a very wide array of formal and informal learning opportunities.’ Across the town, the phrase FOLKESTONE IS AN ART SCHOOL was proclaimed on street-side banners, awnings, billboards, even across the iconic Martello Tower, in the artist’s signature hand-drawn lettering. These outward-facing declarations were also mirrored by the phrase being painted across the rail tracks. It was a bold welcome, a greeting designed for the eyes of those entering Folkestone – by sea or by rail. The statements are one of four strands; another was a series of pedagogical videos – available to watch on the Triennial website. The third was a directory of education and learning opportunities in Folkestone. The artist writes, ‘I thought rather than create a new institution the best thing to do would be to join the dots of all the amazing activity that happens here and reveal to the public what’s going on.’ Although the directory was distributed as a printed publication, Bob and Roberta Smith is keen to insist that it is not complete; ‘We have not drawn a line in the directory and it will never be full… perhaps it will grow to one day overtake Google as a resource for all of us who understand curiosity is oxygen and teaching is a kind of love.’ The final element of the commission was the FIAAS project – which provided twelve nominated students between the ages of sixteen and twenty-three (selected from local schools and colleges) with over sixty hours of workshops from a faculty created from Folkestone’s community of artists. Their final work was exhibited in the teaching space on Tontine Street, and therefore the students became exhibiting artists in the Triennial. Diane Dever’s work for the Triennial was similarly grounded in engaging with existing infrastructure and public space. In collaboration with the multi-disciplinary practice The Decorators, Devers designed and created Customs House: Urban Room Folkestone, renovating a corner of the original Customs House – the rest was bombed during the war. As a significant nineteenth- and early twentieth-century frontier town, Folkestone’s Customs House was situated at the old Harbour Station. Dever drew on the historical significance of ‘customs’ in order to create a new space that can operate as an environment in which to reflect on history in order to encourage productive debate about the future. Dever explains that, ‘members of the public are invited to come in and think about where we’re going’. She was also interested in creating a form of architecture that can spatially articulate thought. The furniture can be used in different configurations, in order to facilitate large-scale or intimate talks, discussions, performance lectures, and film screenings. Both Dever and Bob and Roberta Smith’s commissions are designed to activate and reignite forms of pedagogical public space. 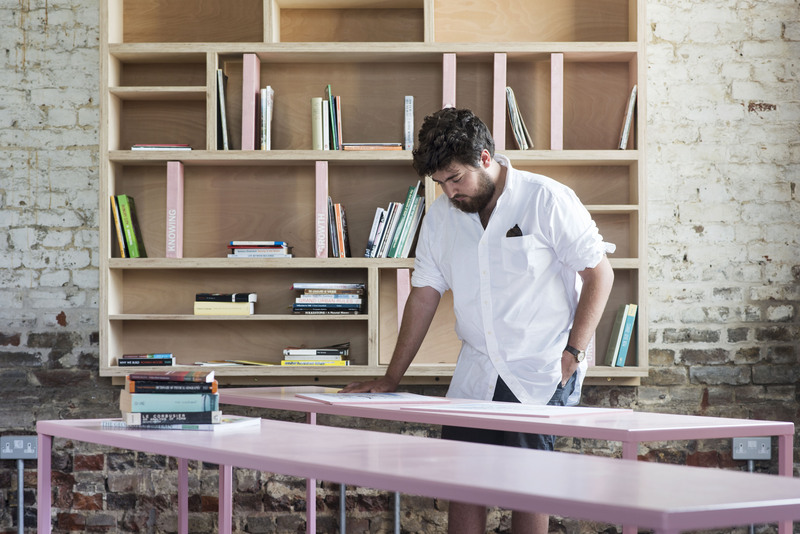 Other artists, such as Sol Calero, created new, social spaces from scratch. In collaboration with Womad World of Art, Calero built a vibrant, brightly painted wooden structure (Casa Anacaona) with help from members of the Folkestone community. Inspired by the Latin-American design, Calero, from Venezuela, hoped that visitors would have a ‘cross-cultural’ experience. In the preface to the accompanying catalogue, The Creative Foundation’s Roger De Haan and Alistair Upton explain that the ‘[the artworks] are commissioned in the context and ambition of positively affecting the urban ecology of the town through the artist’s vision’. Similarly, Biggs stressed that each commission had a significant relationship to the particular place in which it was installed. ‘The artists have been selected in order to illuminate the nuances of the space, as opposed to vice versa.’ However, as is true of any event of this scale, some of the works fulfiled the narrative better than others. The idea that Michael Craig-Martin’s Folkestone Lightbulb (the same lightbulb which has appeared in various guises as screen prints or digital artworks over the years), is specifically geared to ‘illuminate’ the regeneration of Folkestone’s Creative Quarter, feels a little post-rationalised. Similarly, on first encounter, the inclusion of Antony Gormley’s somewhat endless collection of iron men is a slightly tired exercise, however their installation within a damp, algae covered loading bay, covertly accessed under the harbour wall, was a quite fantastic sight. Emily Peasgood’s work, Halfway to Heaven, was installed in the Baptist Burial Ground – which has been inaccessible and stranded above the street for 150 years. As Biggs explains in his catalogue essay, ‘overlooking the Pent Valley, the Baptist Burial Ground was started in the 1750s in the garden of a miller who was a member of the congregation. It remained active until 1855 when the law changed to allow Baptists to be buried in the same cemeteries as established church goers. With pressure on land to develop terraces of boarding house and artisans’ dwellings, the valley sides were cut away and the Burial Ground was left stranded twenty feet in the air’. Peasgood, who is also a composer, researched inscriptions on the tombstones in order to find out about the people buried there. This information was woven into the commission, which took the form of a multi-channel audio installation. 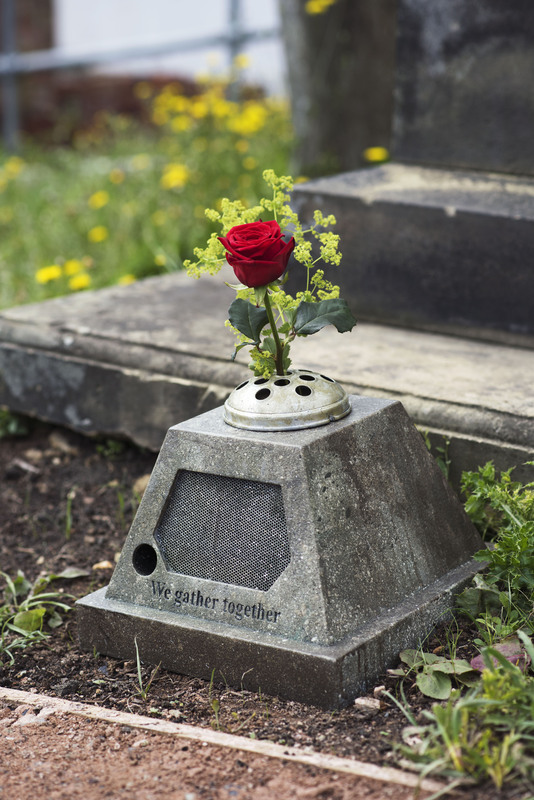 Each channel related to a different gravestone, which are organised in a square, and was triggered by the human presence of a visitor walking past. The result was a powerful and melancholic moment. The polyrhythmic harmony has roots in notions of group identity, and the fusing of multiple individuals to create a collective whole. Not only was one lifted up by the height of the building, but also raised up by the sound of the voices. 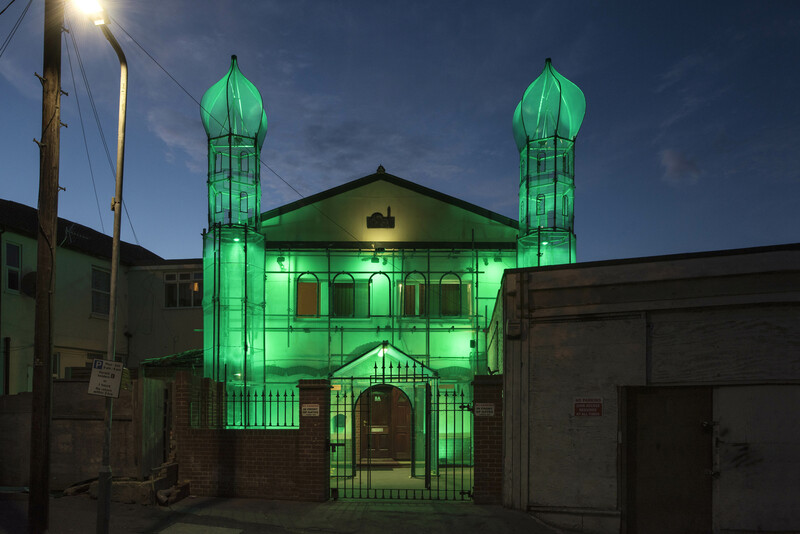 HoyCheong Wong added a temporary façade to the Islamic Cultural Centre, which is housed in an industrial building and has served as a place of worship for the last twenty-eight years. Titled Minaret, the façade used traditional Islamic iconographic shapes, but fabricated from ordinary scaffolding. 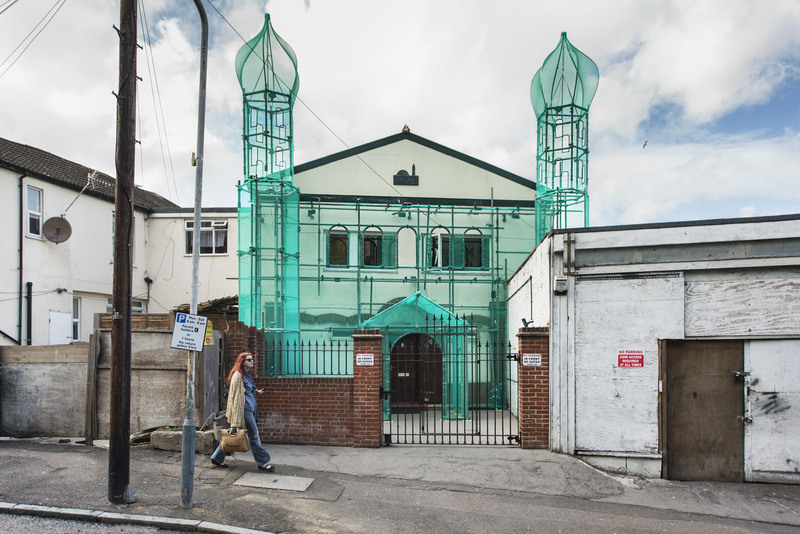 Green, which is the colour of Islam, was rendered with the standard green netting used as a drape between scaffolding to prevent building debris from falling into the street. The façade also lit up at night, increasing its visibility. This visibility was crucial to the commission. 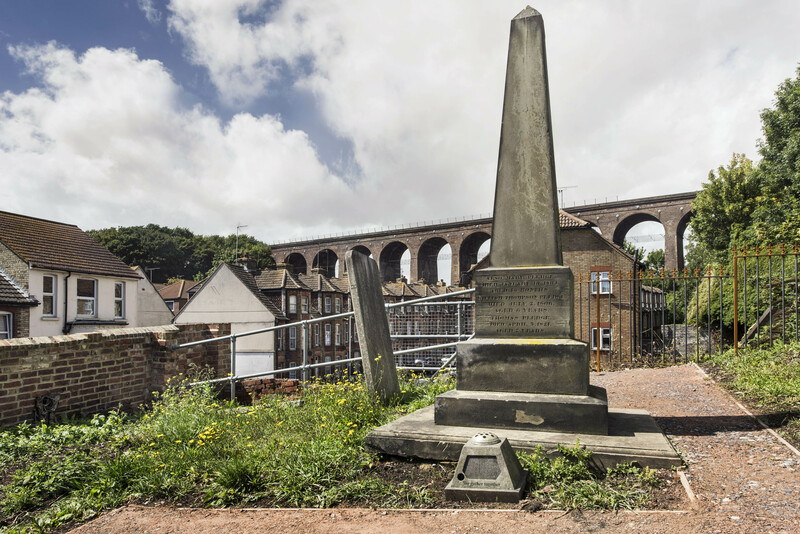 Wong’s intervention may not have worked with a previously inaccessible space like the Baptist Burial Ground, but was part of a drive to make the building more visible to the wider community of Folkestone, and to celebrate it. Many residents were unaware of its existence, previously only signified by a small sign in Arabic on the side of the building. Wong worked with the congregation, asking them what their feelings were regarding their relationship to the town. The overwhelming desire was to take a more active place within the urban and social fabric of Folkestone – to be known, and to be seen. In an era of rampant xenophobia and bigoted violence, this was an understandably brave move. In July, when the installation began to be fabricated, a man was jailed after stripping naked outside the mosque and chanting ‘I’m Catholic until I die.’ However, any actions of this ilk were overwhelmed and overshadowed by positive responses. An open day was also organised on 3 September with a talk between Wong and two members of the centre, Nurul Islam and Habibul Rahman. In 2016, the towns of the South East were almost unanimous in their vote to leave the European Union. This is interesting to consider in relation to the Triennial’s narrative arc, which claimed to have explored universal ‘edge’ issues; ‘borders and frontiers; margins and the periphery; thresholds, gateways and the liminal’. During his referendum campaign, David Cameron threatened residents of the South East with the notion that migrant camps would spring up on their shores, as opposed to in France. On a clear day, the French coastline can be seen from Folkestone. Alex Hartley’s Wall sculpture, which is a contemporary take on a ‘quern-stone monument’, was fabricated from the double fencing used in the refugee camps in Calais. Situated on a precipice, the cage-like form was filled with Iron Age millstones (‘querns’), adding both physical and metaphorical weight. Biggs comments that, ‘perhaps they act as a historical counterweight, preventing the precariously sited sculpture from tipping over the edge’. Jelly Mould Pavilion, by Lubaina Himid, similarly drew attention to Britain’s problematic relationship with the sea. 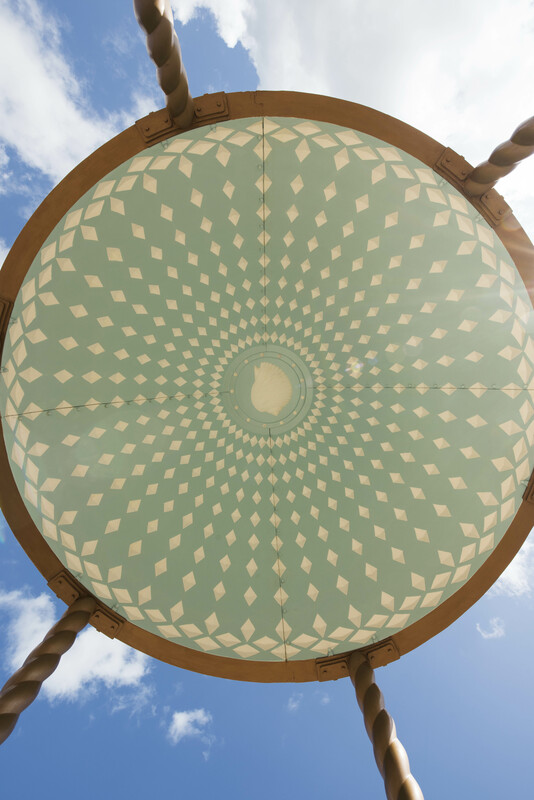 The site of her pavilion is the Rotunda – a beach side amusement park, where barley sugar, rock, candyfloss and toffee apples would have been sold. Himid’s installation highlighted the often-forgotten connections between slavery and the sugar trade. 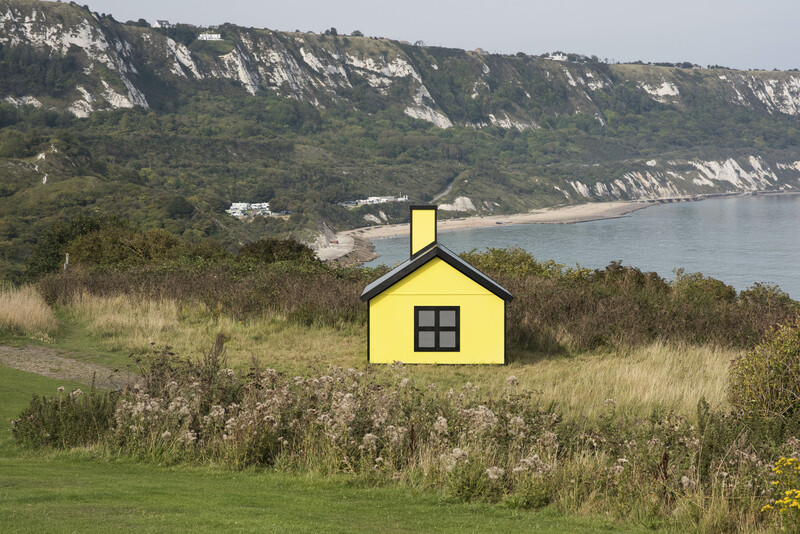 Richard Woods’s Holiday Home commission took the shape of six ‘holiday homes’ painted in bright, garish colours and positioned at various unexpected junctures through the town, cliffs, harbour and beachfront. On one walking tour, a Folkestone resident and local radio station host mentioned that they caused the biggest buzz throughout the town of all the exhibits, with people competing to be the first to find them all. This is undoubtedly a fun exercise. I have fond memories of trying to find all of Andy Goldsworthy’s thirteen giant snowballs before they melted, as part of his ‘Snowballs in Summer’ sculpture trail in London in 2000. The holiday homes are, unsurprisingly, the most shared on social media. In fact, the Jenner Group – who sponsored that particular commission – are running their own ‘#holidayhomeselfie’ campaign. In an age of rampant commercialisation, there is something necessary and refreshing about free, public art for all. Sadly, due to the ever-decreasing amount of public arts funding, these initiatives have to rely on sponsorship, often corporate. The Jenner Group, who are a privately owned regional chartered building company, are heavily involved in the current gentrification of the South East, associated with the significant rise in the number of people moving down from London. Along the beach, just above the Jelly Mould Pavilion, a large area of shingle is being prepared in order for building work to start on new blocks of flats. 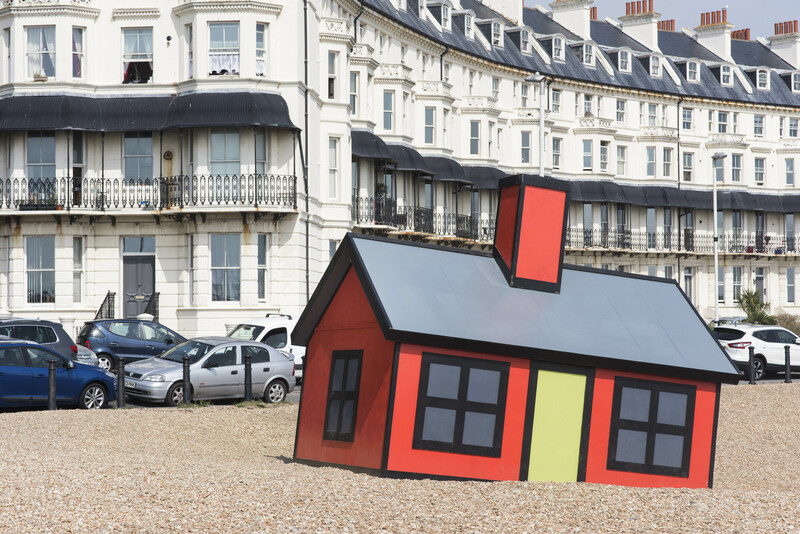 On the Jenner Group’s website, they write that Woods’s artwork ‘questions the concept of “second homes” and suggest that no site is too small, unlikely or inconvenient for a second home’. Whereas, in Biggs’s essay, he goes on further to state that, ‘while the media and construction industries constantly suggest there is a “housing crisis”… the booming market in “second homes” represents a crisis not of housing supply but of economic inequality’. References to the housing crisis, and Woods’s ‘askance view of developers who will build in the most inappropriate places to feed the market’, have been conveniently omitted from The Jenner Group’s text. It is evident that the Folkestone Triennial is starting conversations. Dialogue and discussion are all crucial for encouraging a collective, social body, and intrinsic to the organisers’ desire to create something in the present that will benefit a productive and open future. Philomena Epps is a freelance writer based in London. She is the founding editor and publisher of Orlando (online and in print), an independent magazine that engages with art, culture and sociopolitics. She writes freelance for a selection of publications, including Artforum, Artsy, Artworks London, Frieze, MAP, The TLS and this is tomorrow. She was the Writer in Residence at Jerwood Visual Arts from May–August 2016. Epps has also written exhibition texts and catalogue entries for institutions, such as Pippy Houldsworth Gallery. During 2015–2016, she was hired to work on research for the ‘Performance at Tate: Into the Space of Art’ AHRC project at Tate. Her essay ‘The Personal and the Political: Jo Spence and the Day of the Deadʼ was published in Jo Spence: The Final Project (Ridinghouse, 2013). Epps worked as the intern at Third Text from June 2015 to March 2017; she has a BA in English Literature from the University of Sussex and an MA in History of Art from The Courtauld Institute of Art.